As you may or may not know, this is the sequel to American McGee’s Alice, which debuted in 2000. The sequel almost took as long as Duke Nukem Forever, although this one wasn’t ever anticipated until recently. If you were wondering for some outlandish reason… yes, I platinumed this game. I think I’m making myself a new rule: if the game is newish, and I platinum it, I HAVE to review it. So what’d I think of it? Was it underwhelming like most said, or was it absolutely amazing? Let’s go down the rabbit hole to find out. 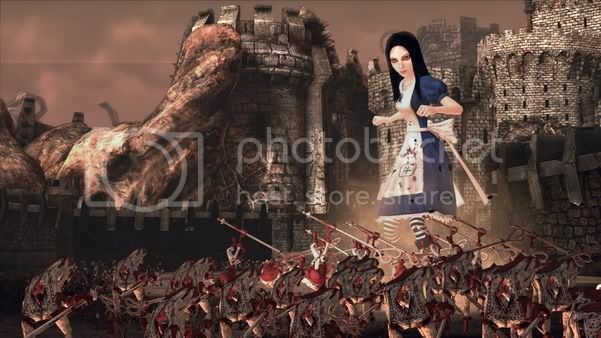 Prior to being given the choice of the red or blue pill though, I think it’s important to look at where this came from – I played the first (it comes with a new copy of the game) to get back into the proper mindset of the American McGee universe. Unfortunately, I was taken aback by the controls; I forgot just how wonky they were. The game itself was still fun, but I recall it being better – then again, it is eleven years old. And graphically speaking, it still holds up fairly well. The weapons are still innovative and fun to use, and the characters are enjoyable, and the platforming is just… gah. Awful. I died so many times because of the controls and collision detection. But I digress, the game was fun, and a great introduction into the new game. Madness Returns is broken up into six chapters, though we’ll say five, as the last one is minuscule in comparison to the others. Each chapter is preceded by Alice in a Victorian London where she meets with people from her past, and each one of these sections more or less prefaces the events for the next chapter in Wonderland. While it isn’t much more than a dark looking environment with story telling as you walk around, it is beautiful and a nice, brief change from the fantastic Wonderland that you spend so much time in throughout the course of the game. 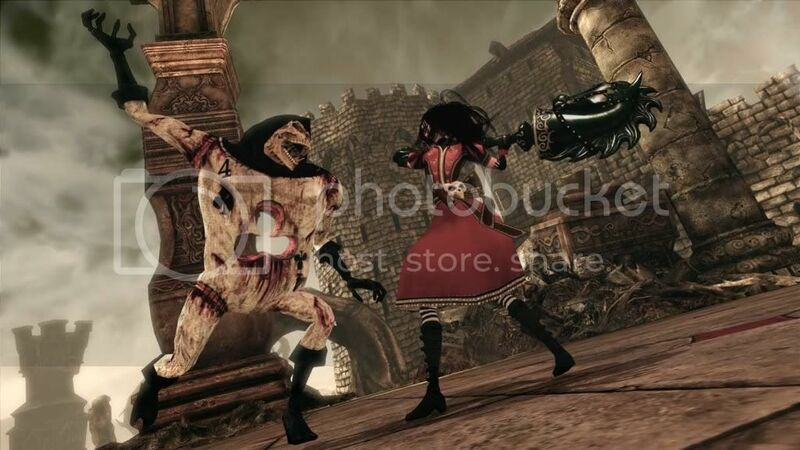 The gameplay consists of fighting using a few weapons that you find – obviously there is the Vorpal Blade (melee weapon), a projectile weapon, a strong weapon, and a stronger projectile. Oh, and a timebomb, which is used as a distraction against enemies, opens some areas prior to getting the “strong” weapons, and helps with a few puzzles. Beyond this there is the platforming, which is much easier this time around thanks to improved controls, as well as puzzles to complete. Oh, and I suppose you can say that collection is also a major gameplay element, as there are memories, pig snouts, red rose paint, and bottles to collect througout the game, amongst a few other miscellaneous things related to story progression or a trophy of some sort. And who can forget the 2D minigames?! Awesome stuff. Well, one was, at least. Played like Pitfall, and the art direction of it was just… well, my jaw dropped. Speaking of art, this game is BEAUTIFUL! And I don’t mean to say it’s lifelike. I mean the direction of it is just… well, it is fitting for a place called Wonderland. The enemies are also very unique for the first portion of the game (it got a bit less imaginative as time went on). I caught myself just stopping in some of the environments and looking around (aside from looking for the collectibles) to really appreciate what the developers created. It’s not too often that a game is dependent upon the environment, but without it, this game could be passed off as any other present day action/adventure game. The gameplay itself is one thing, how it’s executed is another. Fighting varies from just rushing in and not worrying about life on Easy to utilizing the dodge button ever couple seconds on Nightmare. Platforming is enjoyable, though the amount of invisible walls I encountered in the game were maddening (no pun intended). And I’m not talking about exploring and being stopped from where there was no properly rendered environments – I’m talking about walking along the main path and just being stopped. For no reason. Or fighting an enemy, and getting stuck in a wide open area on absolutely nothing. This is really only an issue when playing on Nightmare, as it will result in imminent death if you don’t get out of it fast enough. Oh, and as for checkpoints, they are somewhat sporadic. If you get killed by an enemy, you may start where you are, or maybe a few rooms back. It just depends. However, if you fall to your death, you don’t lose any life, and you respawn on the last solid ground you were on. The different mechanics for killing enemies are easy enough to figure out and work well. Some enemies require deflecting projectiles, hitting the back of them, stunning, etc. The puzzle minigames are explained prior to playing them, and are a nice change from the rest of the game. Each chapter has a different one, such as the 2D Pitfall like one, a 3D “miniature golf” of sorts, chess, block puzzles, etc. Being that this isn’t an RPG that you can spend hours upon hours on, I’m going to say it’s a RENT. 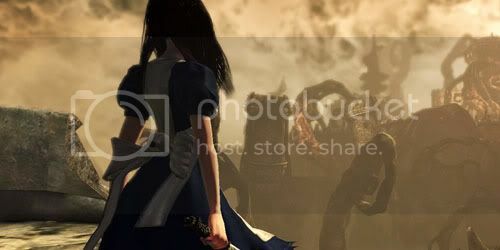 I think it’s definitely worth playing, and if you love the story behind Alice Liddell, as well as the first game, you should buy this. But for the majority of people, it’s worth renting as you can easily beat it within a week.